What follows is not entirely up to date because I recently came to new representations of rhythm which I’d like to discuss in future articles. For now though, the good « old » model I’ve used for the past years is still accurate and will probably remain most suited when it comes to musical description and notation of rhythmic phenomena. It is also most adequate to stimulate and orientate instrumental practice. However let me just mention here that the new representations of rhythm I’m working on are all about considering rhythms as a result of some kind of waveshaping applied to the the waving quality of Time. Together with physicist Andrea Giammanco from CERN we have started discussing analogies between the present theory and possibly existing mathematical models from the fundamental physics domain. These exciting discussions might be the premises of important theoretical developments with potential applications to electronic music software and hardware design. A rhythm pattern of n elements and with a total duration of t can be considered as an extremely phrased n-tuplet over the duration of t.
Therefore there is a theoretical infinity of phrasings for any given n-tuplet. The straight n-tuplet is an exception rather than the norm, all other n-tuplets consisting of notes of unequal durations. Between this extremely phrased tuplet and the evenly distributed tuplet, there is an infinity of tuplets which can be attained while morphing gradually from the phrased tuplet to the evenly distributed tuplet. One such tuplet can be described through the amount of phrasing that it presents. Tuplets happening over a duration equivalent to the pulse period can define microtime (or micropulse). A phrased microtime is termed groove. The amount of phrasing is then referred to as amount of groove. When a groove is applied to the micropulsatory grid it reveals and reinforces the pulse. Indeed, the pulse’s frequency becomes clearly perceptible thanks to the groove’s recurring distorsion of the microtime cycle. As I mentioned earlier in this article, I am currently working on new developments wherein I actually begin to consider that, rather than the micropulse, it is the time flow itself that is distorted. This notion is tied to the observation that the playing musician’s time perception differs from the linear and evenly segmented time which is normally used to describe music. So instead of being linear, the time flow is happening in waves that present a recurring shape. 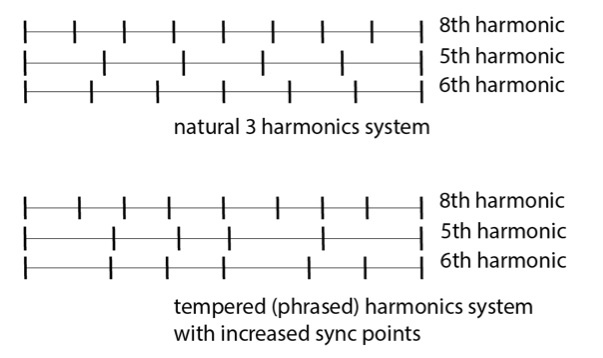 Through phrasing, distinct rhythmical harmonics can harmonise « more » in the sense that synchronisation points are multiplied. An added effect is a relative multifunctionality of each harmonic. In this regard, it is similar to the pitch temperament concept used in Western music. This opens a new field of observations and concepts that I call Functional Rhythm. I’ll discuss this in more detail later as well. To indicate phrasing, I add a system of small headless notes above the main staff. The durations of those small notes represent the relative durations of the phrased elements. The stems of those small notes are aligned with the notes of the main staff that they influence. The intensity of the phrasing is notated as a percentage. 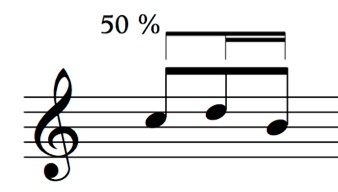 At 0%, the rhythm is played as notated in the main staff; at 100%, it is played as notated with the small headless notes.